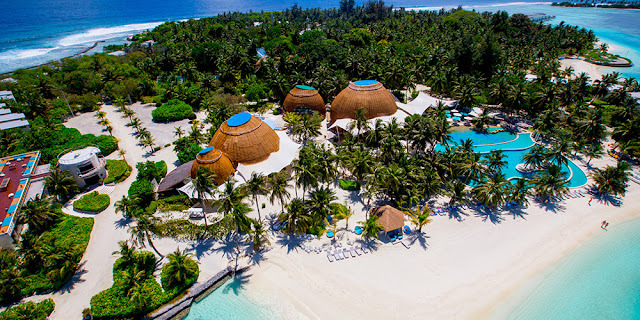 Holiday Inn Resort® Kandooma Maldives has 160 villas in four different styles of beach and garden villas, beach houses, family villas and over water villas. Each villa type at this Kandooma resort in Maldives has been designed with cool clean lines with whitewashed timber providing warm texture to the unshod foot. Large picture windows mean that you are only a glance away from the great blue outdoors. The connected iPod generation need not fret as the island is completely covered with Wi-Fi broadband. Didn’t bring your iPod? No problem, the reception has a selection for a loan which is already programmed with a diverse playlist. Grab a coffee and wood-fired pizza from the Bokkuraa Coffee Club beside our sparkling infinity pool, or unwind with a good book and views over the peaceful lagoon. You can indulge in a soothing massage and beauty treatments in our Kandooma Spa at this Maldives honeymoon resort, and book the Spa Suite’s private garden with plunge pool for a romantic afternoon. Learn to sail on a catamaran trip around the region’s sandbanks and take it easy with cocktails on a sunset cruise. It’s just 5 minutes by boat from Holiday Inn Resort® Kandooma Maldives for diving and snorkelling among colourful tropical fish at the reef. Face-painting and fun games keep the children entertained at our Kids’ Club, while parents unwind with a game of tennis or a workout in our fully equipped gym. Top off a perfect day with a Maldivian seafood feast and breathtaking sunsets on The Deck at The Kitchen restaurant. The Republic of Maldives is a group of 26 atolls in the Indian Ocean; an Island nation located about 700 km south-west of Sri Lanka. The Maldives’ features 1,192 islands, roughly 200 of which are inhabited by local communities. More than 100 of these are used as resorts. The islands stretch for about 800 km from North to South, 130km at the widest point with no geological feature higher than 4 feet above sea level. No prior visa is required to enter the Republic of Maldives. A 30-day entry permit will be granted to visitors on arrival at designated ports of entry, based on the immigration requirements. There are many international airlines flying into the Maldives, offering good connections from Paris, London, New York and Singapore to name a few.